EximiousSoft Logo Designer adalah software design yang cukup populer dan memiliki kemampuan untuk membantu anda membuat / menciptakan berbagai macam design logo bagus yang mengagumkan. 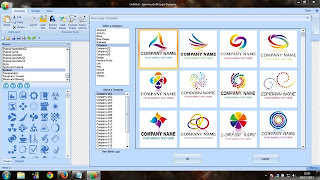 Software ini menyediakan tools untuk alat gambar yang sepenuhnya berbasis vektor dengan banyak objek logo yang bisa anda gunakan untuk keperluan pembuatan gambar logo milik anda. EximiousSoft Logo Designer juga dapat digunakan untuk menyesuaikan grafis dengan kualitas tinggi untuk bisnis profesional seperti kartu nama, kop surat, poster dan lainnya, di samping itu semua template dalam logo designer meliputi berbagai bidang di hampir semua industri, seperti teknologi, keuangan, kesehatan, pendidikan dan pelatihan, perjalanan dan pariwisata, organisasi, olahraga, makanan dan minuman dan lain sebagainya. Provides 200+ pre-designed templates. 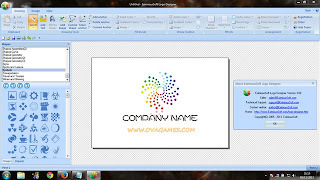 Just choose a logo layout you like from the collection of pre-build templates, edit the elements of the logo, add your business name and slogan. And finally, apply some styling. That is your own impressive logo. 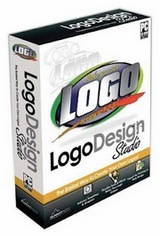 Includes 2000+ high-quality shapes, signs, symbols, graphics etc. .You can apply a range of special gradients and other effects for which. Create any shape graphics as you desired with these tools. Move, delete or add even convert anchors for a shape with simple clicks or drag.That's really simple. Shapes or texts can be filled or stroken with solid color, gradient style or images high smoothly.anyone, regardless of creative ability, can blend shapes and text into an impressive logo in a few clicks. Gives you the option to add drop shadows, reflection, glow, 3D bevel with customized settings to shapes or texts on your logo. Any shape objects even texts can be stroken with more pre-designed dash style. Works like a great image editor program that supports strongly layer-editing. With the Layers feature you can control the position of various objects in your logo, you can place a more important object over the other and create different effects. To create, move, resize or rotate shapes or texts only with drag or click. 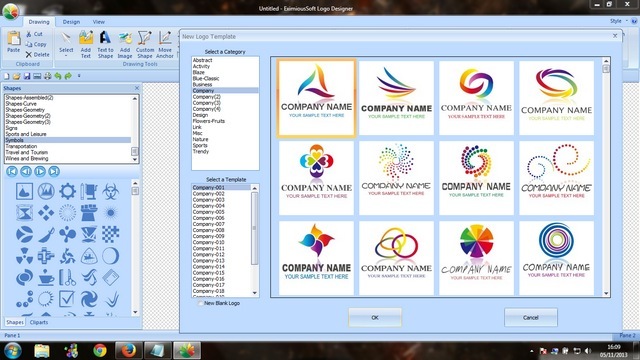 Making a great logo becomes really easy with Logo Deisnger. The program is intuitive enough to figure out what it does without the need to read user manual. Just start choosing logo templates, do some click or drag for modification. 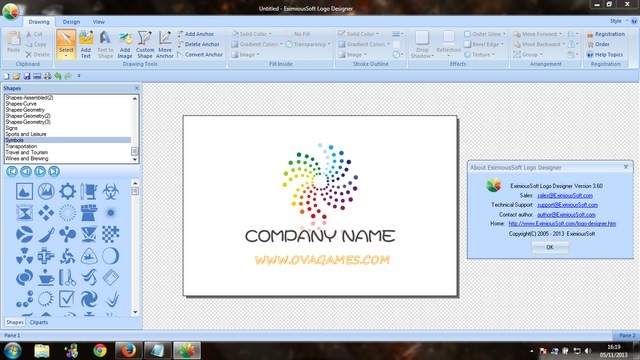 After half an hour you may find yourself with a logo that makes you look like a logo design star! Supports your logos export to JPG, GIF, PNG, BMP, PCX, TGA, TIFF files (For PNG or GIF file, the background of images can be set to be transparent). Also supports to print logo from your own printer with high resolution. Allows to load image files from GIF, BMP, PCX, JPG, TIFF, PNG, TGA, PSD, ICO, CUR, ANI ect. files. It is used to customize high quality professional-looking business graphics such as such as business cards, letterheads, posters and other business stationery etc..